2017 was a banner year for the Surfrider Foundation. Our grassroots network achieved 50 coastal victories to protect our ocean, waves, and beaches, one of the most successful years in Surfrider’s storied history. These victories tackled a range of coastal threats – from seawalls to plastic pollution to sewage overflows to oil terminals – and are a testament to the power of citizen activism. The Surfrider Foundation 2017 Year In Review from Surfrider Foundation on Vimeo. Yet, these victories tell only part of the story. Over the past year, Surfrider engaged over 52,000 volunteers in our chapters and youth clubs. These individuals are the leaders in their communities, schools and neighborhoods who provide a never-ending commitment to defend our coasts. They are the ones who organize chapter events, clean beaches, green campuses, speak at city council meetings and wage the battles against harmful projects. The Surfrider Foundation also flexed its muscles at the federal level to defend our coasts. By spring, the Trump administration had issued executive orders to expand offshore oil drilling, eliminate clean water and climate change programs, and shrink our national monuments. Surfrider quickly sprang into action, launching national campaigns and mobilizing our supporters to speak out. Our efforts contributed to one the largest grassroots responses ever seen as millions of Americans contacted their federal officials on environmental issues. The overwhelming response to these federal attacks helped stall the administration’s efforts and has given hope that we can minimize impacts from these proposals in the coming years. Rest assured that Surfrider’s network is only beginning our fight to defend our nation’s coasts from these threats! Below is a summary of some our 2017 achievements across each of our focus areas. We extend a heartfelt thank you to all of our chapters, volunteers, supporters, and partners who contributed to this success! 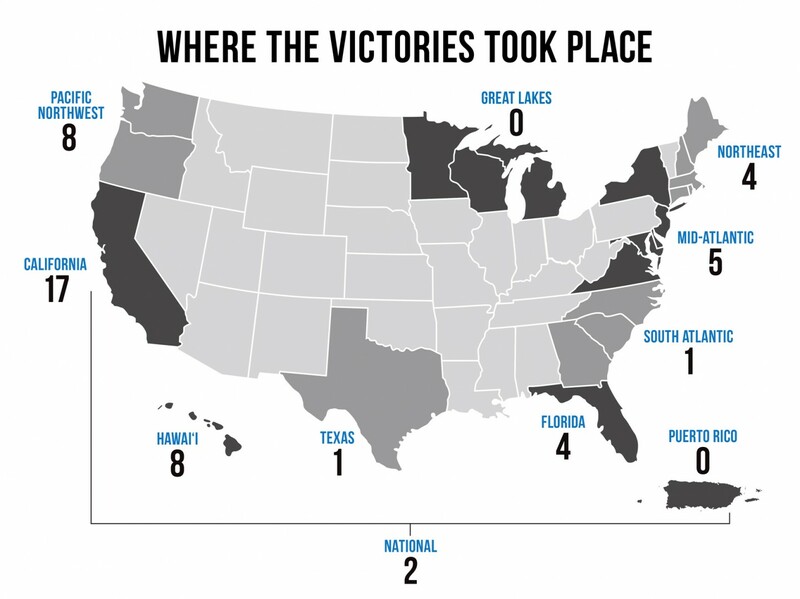 Surfrider secured 8 victories to protect water quality at the local, state, and national levels. We saved federal funding for the BEACH Act to monitor water quality at beaches nationwide. We passed policies in California to incentivize water conservation and recycling. And, in Hawaii, we compelled public agencies to post water quality advisories. These campaign victories were complemented by Surfrider’s volunteer monitoring of hundreds of beaches, installation of Ocean Friendly Gardens, and numerous community partnerships to solve local pollution problems. Over 3,500 U.S. beaches monitored for water quality thanks to successful Surfrider advocacy in support of the federal BEACH Act. Over 400 beach and stream sites monitored by Surfrider volunteers through our 39 chapter-run Blue Water Task Force labs. 15 million gallons of polluted runoff prevented through the installation of Ocean Friendly Gardens. Surfrider secured 16 victories to reduce and prevent the harms of plastic pollution on our coastal environment. Notable wins included protecting Maine’s Bottle Bill, creating an Oregon Marine Debris Action Plan, banning plastic grocery bags in Boston, and passing foam container bans on Maui and the Big Island of Hawaii. Surfrider’s network also tackled plastic pollution through community outreach, beach and watershed cleanups, and rapid growth of our Ocean Friendly Restaurants program. 17 billion plastic shopping bags kept out of landfills, watersheds, and ocean annually through our successful passage and defense of bag legislation. 145,000 pounds of plastic and other trash removed from beaches and parks through the efforts of over 25,000 volunteers. 26 million plastic-free meals served by Surfrider Ocean Friendly Restaurants. Over 4 million people educated about the impacts of plastic pollution on the ocean environment through our Rise Above Plastics program. Surfrider secured 12 victories to protect U.S. shorelines from coastal development and climate change. Notable wins included expanding the California Coastal Monument, protecting Oregon’s Cape Lookout from a proposed golf course development, and defeating three proposed oil export terminals on the Washington coast. We also launched the Smartfin program to engage surfers in citizen science efforts to monitor the effects of climate change on the ocean. Finally, Surfrider released the State of the Beach Report in November, generating national media coverage to hold states accountable for strong beach preservation policies. 6,200 acres of coastal land in Humboldt, Santa Cruz, and San Luis Obispo Counties protected through monument expansion. The last coastal sand-mining plant in the U.S. is closed, freeing up 270,000 cubic yards of sand a year to stay on Monterey beaches. Oahu’s north shore protected from a controversial housing development in Haleiwa. Legislation passed Hawaii to increase carbon sequestration and reduce effects of climate change. Surfrider secured 3 victories to protect and restore ocean ecosystems in U.S. waters. Notable wins included stopping seismic airgun blasting off the Atlantic coast, expanding the Cherry Point Aquatic Reserve in Puget Sound, Washington, and protecting California state waters from new offshore oil platforms. Meanwhile, Surfrider ramped up federal campaigns to stop the Trump administration’s efforts to expand offshore drilling and shrink marine monuments and sanctuaries. Finally. Surfrider played an integral role in supporting the success of marine protected areas (MPAs) through education, advocacy, and stewardship. Regional ocean plans in the Northeast and Mid-Atlantic implemented to protect the marine ecosystem and coastal recreation uses. 50+ marine protected areas (MPAs) in California and Oregon state waters successfully implemented through public support and engagement. 260,000 square miles of ocean habitat in the Atlantic protected from seismic blasting by the Obama administration. NOAA’s ocean and coastal management programs defended from drastic funding cuts. Surfrider secured 11 victories to protect and improve coastal access in the states of Maine, Florida, California, and Hawaii. Notable wins included protecting beach access in Miami Beach, Florida, defeating a river access fee in York, Maine, and passing a state law in California to improve coastal access through lower cost accommodations. Surfrider also secured a favorable court ruling to affirm public access to Martin’s Beach, CA which billionaire Vinod Khosla has been blocking since 2010. Finally, Surfrider partnered with community groups across the U.S. to help bring thousands of underserved youth to the coast. Enhanced low-income beach access opportunities in California through passage of a state law and advocacy before the California Coastal Commission. Brought over 5,000 people, including underprivileged youth, to the beach through International Surfing Day. Defeated preemption attempt in Florida to take away county's’ rights to employ customary use as a justification for beach access. Want to get involved? Find your nearest Surfrider chapter or support Surfrider coastal defenders!